Did you read the story. Did you check for accuracy of content. A hint, does anyone buyer purchase 25% of our corn. As big buyer, but I would say china. 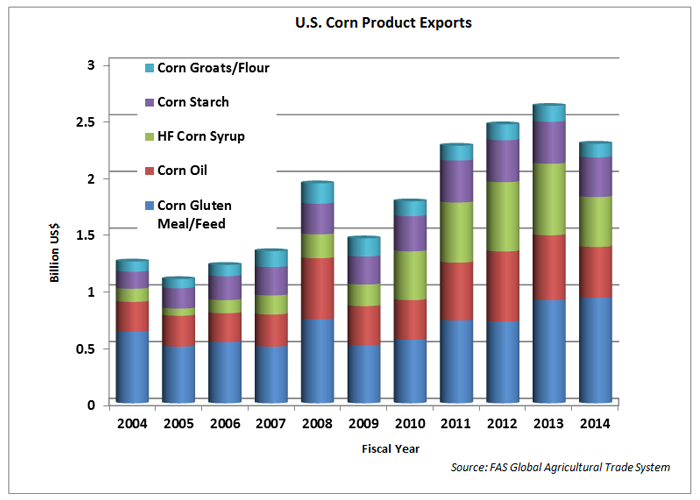 In the 2014/2015 crop marketing year, (Sept. 1- Aug. 31) the United States grew nearly 14.2 billion bushels (360 million metric tons) of corn and roughly 13 percent of production was exported to more than 100 different countries. Japan (26 percent), Mexico (23 percent) and Colombia (9 percent) made up the top three of U.S. corn destinations. "Mexico bought nearly 25% of all U.S. corn last year, totaling $2.6 billion." Lets see at 3.75 per bushel. --2.6billion$$ buys you 693.33million bushels. That is 4.952 % of the US Corn last year. If the exporter takes no profit. liakmf is absolutely hinting us in the right direction... CNN fraudulantly miss states their lack of truth. I read claims of cheap US corn driving farmers out of business and lowering Mexican production........ can't find data that backs that up. And many of these high import years for mexico have been high priced corn years. Here are a few things to feed your thinker...... Put down those political rags and think it about it after you've vomited up the rat bait you been consuming. The flood across the boarder is real.... people that is. Did Mexico's corn production really go down after 1994 NAFTA? Small and mid-size Mexican farmers couldn't compete in that environment and had to abandon their farms. I find no evidence of that in production records published by Mexico. Just a lame attempt to generate a foothold in bargaining with a neighbor who has asked them many times to help with a people trafficing problem and an abuse of the american social services system..
Used farm equipment continues to go south across the border. "Right now we have hostile position from the U.S. and we have all our eggs in the same basket, so we should probably start diversifying in the short term," Rios said. How about diversifying the Senate in Mexico by proposing a bill to create a system to address poverty in Mexico. And some control of the crime that slobbers over into the US so the folks in Plains, Ks don't have to worry about Mexican drug cash being laundered in their local bank. We have watched amnesty fail two or three times now.... When neither mexico or our own bureaucrats will enforce the law, forgiveness is just asking for more, and the one thing Mexico is good at is creating poverty. I want legal people who will pay taxes and be good citizens to cross that border and enjoy our system. But without enforcement you don't have a law. I know I waste the time to type but I gained hope in this election to feel that not everybody is on the take, wants to be on the take, or just can't read and needs to be told how to vote.... That translates in farming to ...... not everybody farms their mailbox, or cheats their landowner, or needs to grow by taking away from others. sw and others, this might be an interesting site to put in your favorite list, so you can do some looking around for answers. but, if you look at the imports from the U.S....note that it's almost 0 for two years.